On the evening of Friday, December 12th the HKVCA held its Christmas Cocktails party on the 27th floor of Club Lusitano. More than more 80 people from all sectors of the industry attended this much loved annual event. We would like to offer our special thanks to Dr Alfred Cheung who spoke on the subject of "Cool Logistics Opportunities in China". Thanks also to our Venture Committee and especially to our cocktail sponsors, Dr. Alfred Cheung, Teresa Ng and Patrick Lim from APTTPA and Simon Mak from Ascent Partners. On 10th December, Amit Garga and Karan Khemka, partners at The Parthenon Group, offered their expertise to an audience of 50 members at an HKVCA Masterclass on how to execute successful investment strategies in the education sector. They also discussed the unique opportunities that are present in China’s education market. The class was comprised of case studies involving a number of actual successful education deals, with some key takeaways that included identification of the drivers of value creation, the benefits and challenges of investing in education, and which specific segments in the China market are most attractive. We would like to thank The Parthenon Group for their sponsorship of this important event. At a brownbag luncheon on Thursday, December 4th, Serge Hoffmann of Bain & Company gave a presentation to 22 members on the current key e-commerce trends in China. Among the topics addressed were the options traditional offline players have to invest and build their omni-channel capabilities, ways to leverage digital tools so as to increase engagement with end customers and the trends and opportunities to enhance the online ecosystem. The growth and potential of the private equity industry in China has captured the attention of a global audience. Many investors are eager to be a part this exciting market, but they are wary of upcoming legal and regulatory changes. 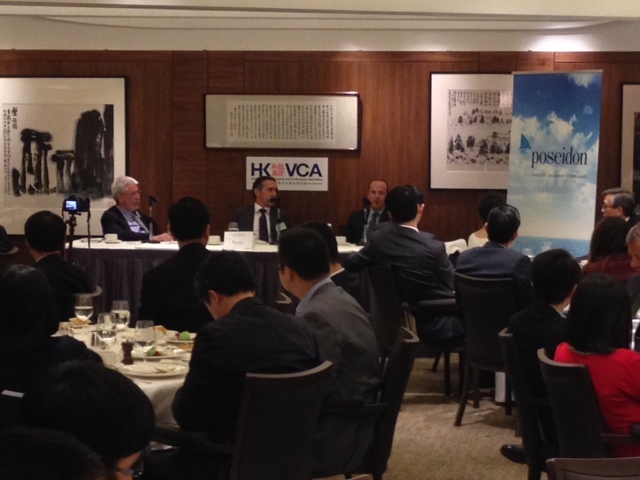 With these key topics in mind, The Poseidon Group recently hosted a HKVCA Luncheon Talk on November 24, 2014 in order to explore recent and imminent changes. In the 30-minute talk, William Hay, the General Counsel at Baring Private Equity Asia, Brian Schwarzwalder, partner at Ropes & Gray LLP and Velisarios Kattoulas, Chief Executive at The Poseidon Group, shared their views on the recent changes in China and the industries that are likely to be affected. As seasoned practitioners in the legal and compliance space, they discussed issues around legal systems in China and the balance between conducting business in emerging markets, and compliance with international anti-bribery laws. The HKVCA’s 13th Wine Tasting event proved to be another fantastic evening for wine lovers. Hosted by Marcus Thompson, the event was held at the Hong Kong Club on November 10, 2014. The special theme of the tasting was the amusing “Don't be mortified - Try Fortified!”. Master of Wine, Debra Meiburg, took the attendees through a selection of bold vintages including the D'oliveira Verdelho 1966, D'oliveira Boal 1968, Delgado Zuleta Quo Vadis Amontillado NV, Lepanto PX Solera Gran Reserva NV, Taylors 20 year old Tawny and Fonseca, OWC, and the Porto 1985. We would like to extend a special thanks to our sponsors, Clifford Chance and Alter Domus. The HKVCA’s Private Equity Fundamentals Course, our comprehensive training course designed for those wishing to enhance their knowledge of the core fundamentals of private equity and venture capital, was held this year over a period of from September 17 to October 30. The last day of the course, which covered case studies on Pacific Coffee and GE Equity Asia, were completed on October 30th and attracted around 45 participants. Both case studies were conducted in a group discussion format which were well received from our attendees. We would like to extend a special thank you to our speakers Oscar Chow from Chevalier Group, Roger King and Winnie Peng from HKUST, and Mark Chen and Siddharth Sharma from GE Equity. The HKVCA hosted a luncheon talk discussing the importance of due diligence from the financial perspective and how effective due diligence can help mitigate risk. The luncheon, held at the Hong Kong Club, attracted 35 dedicated HKVCA members. We would like to thank FTI Consulting for their sponsorship for hosting this important topic to share case studies on the way financial statement fraud is often conducted in Asia and practical tips for financial statement analysis as well as financial due diligence for value creation. The HKVCA hosted a luncheon talk discussing the implementation and practicability of opening fund accounts in the newly opened Shanghai Free Trade Zone. The luncheon, held at the China Club, attracted more than 60 members. We would like to thank Fangda Partners for their sponsorship of this most successful event and for hosting the discussion on this timely and important topic. Our monthly breakfast meeting was once again oversubscribed in August with almost 70 members in attendance. We would like to thank our sponsor, Poseidon, for helping make this great networking event possible for our members. The HKVCA Private Equity Fundamentals Course is a comprehensive training course designed for those wishing to enhance their knowledge of the core fundamentals of private equity and venture capital. The course also serves to refresh and upgrade the skills of professionals in the industry. This year the course is especially pleased to have the support of the Hong Kong Stock Exchange, Hong Kong University and the Hong Kong University MBA program, as well as the MBA program at the Hong Kong University of Science and Technology. The third and fourth day of the course, which covered transaction documentation and post investment matters, were completed on October 8th and 10th and attracted around 80 and 45 participants respectively. We would like to extend a special thank you to our speakers, namely, Jesse Sheley and Frank Sun from Kirkland & Ellis who spoke about deal protection and risk allocation issues; Edwarde Webre and Robert Woll from Deacons, who discussed non-leveraged/VC transactions; Simon Cooke and Neeraj Budhwani from Clifford Chance who spoke on buyouts; John Levack from Electra Partners Asia who covered management of portfolio companies; and Anna Cheung and Michael Chan from FountainVest Partners (Asia) and Hong Kong Exchange and Clearing who discussed exit strategies. Josh Jacob and Kallan Resnick from Hamilton Lane and Park Hill Group who discussed LP Universe & Fund Raising. The HKVCA Private Equity Fundamentals Course is a comprehensive training course designed for those wishing to enhance their knowledge of the core fundamentals of private equity and venture capital. The course also serves to refresh and upgrade the skill set of professionals in the industry. The modules are led by highly experienced industry practitioners - experts with years of experience in deal-making, structuring, corporate value-creation and exits. Instructors often utilize real cases as a way to illustrate and share insight gained through years of industry practice, providing in-depth technical and practical know how for interested participants. This year, the course is especially pleased to have the support of the Hong Kong Stock Exchange, Hong Kong University and the Hong Kong University MBA program, as well as the MBA program at the Hong Kong University of Science and Technology. Marvin Lai from the HKVCA and iTM Venture, who provided an introduction to the subject of early stage investment and the screening process. Christiaan Kaptein from Arbor Venture who spoke on entrepreneurship. Scott Peterman from Sidley Austin who spoke on negotiation and term sheets. K O Chia from the HKVCA who discussed early stage post investment and exits and also provided an introduction to private equity. Alice Chow from FLAG Squadron Asia who spoke on private equity in Asia. Lorna Chen and William Chou from Shearman & Sterling discussed established PE funds. Jesse Sheley and Frank Sun from Kirkland & Ellis spoke about the principal regulatory issues in China. Vincent Warner from Chepstow Capital discussed deal sourcing and due diligence. Robert Kwok of Ernst & Young spoke on valuation issues. William Ho of CVC Asia spoke on deal financing. Victor Lee of PwC Hong Kong discussed “high level" tax issues. A luncheon talk delivered by Christina Gaw, Managing Principal of Gaw Capital Partners, and Jie Gong, Partner at Pantheon Ventures, was held on September 15, 2014 at the China Club. Providing substantive information on the latest developments in Chinese real estate from an investor perspective, the event was supported by accounting firm KPMG. Close to 70 members were in attendance, highlighting the increasing interest of private equity in the real estate sector. Conrad Tsang, Chairman of the HKVCA, said: “Today we have a diverse membership of 300 global, regional, and home-grown professional firms, with continued growth both in terms of breadth as well as depth. Our members represent the full gamut of private capital market participants in Hong Kong, Greater China, the Asia Pacific region, and other parts of the world, reflecting Hong Kong’s unique status within China and as a global business and financial centre." On August 29, 2014, the HKVCA hosted its first ever women-focused luncheon talk, held at the offices of Latham & Watkins and attended by a record high number 90 members and guests. The discussion provided practical insight into the experiences and obstacles that women entrepreneurs encounter during the fundraising process and what investors can do to help women address these challenges. Our special thanks goes to Moderator Allison Baum of Fresco Capital Advisors, and speakers Camille Tang of ConvenientPower Group; Cat Purvis of Exicon; Linda Wu of Gowell Software; and Diana Olteanu-Veerman of 85Broads Hong Kong for their sharing their invaluable experiences and recommendations with our enthusiastic audience. More than 40 young professionals attended this fabulous networking event which is held at Havana Bar in Lan Kwai Fong. The 13th China Private Equity Summit and the 1st Hong Kong Venture Capital Forum, organized by the Hong Kong Venture Capital and Private Equity Association (“HKVCA”), took place today. Attracting more than 450 venture capital and private equity practitioners, leading corporations, and other industry professionals and participants from across the region, the summit discussion focused on the latest developments and trends in the private equity market in China. Held at the Hong Kong Convention and Exhibition Centre, distinguished guests at this one-day event included: Professor K C Chan, Secretary for Financial Services and the Treasury of Hong Kong SAR Government; Antony Leung, Chief Executive Officer of Nan Fung Group; Bryan Chan, Managing Director and Co-Head of the Equities and FIC Business, Global Market Division of Hong Kong Exchange & Clearing, and Chief Executive of China Exchanges Services; Fred Hu, Chairman of Primavera Capital Group; Hans Tung, Managing Partner of GGV Capital and Gavin Ni, Founder, Chairman and Chief Executive Officer of Zero2IPO Group. The China Private Equity Summit explored GP and LP perspectives on the China private equity environment, regulatory developments, as well as due diligence and risk management in China. Other topics included value creation within portfolio companies, RMB funds, Chinese overseas investments, and exit channels for Chinese portfolio investments. Media Coverage can can be viewed here. Photo Highlights can can be viewed here. Nick Gronow and Stuart Witchell, both Senior Managing Director at FTI Consulting Director, and Ning Zhang, Counsel at O'Melveny & Myers LLP, reviewed major events and trends, and offered guidance on how investors can protect themselves from risks that may or may not be apparent from financial records. The talk, which drew an audience of 35 participants, also addressed issues from investigative, financial and legal perspectives, as well as key case studies from around the region. On May 13, 2014, a luncheon talk was held at the offices of Proskauer's Office which was attended by an audience of 25 dedicated members. Speakers Lynn Chan, Consultant of Proskauer shared her expertise on structuring a proper GP Arrangements. In a brownbag luncheon presentation titled “Two-way Communication” held on Wednesday 30 April, Technical Committee Chairman John Levack gave members feedback on the issues being discussed in the committee and addressed some of the current challenges to PE firms from a tax, legal and regulatory perspective. Our extremely popular wine tasting event once again as well as a long waiting list of those wishing to attend. Special thanks to our sponsors Alter Domus, Clifford Chance and Poseidon. The star of the evening was “Master of Wine” Debra Meiburg who took us through a journey of French Reds. As always the talk was both entertaining and instructive. Thanks also to our organizing committee and especially Anthony Chan, Alain Fontaine and Marcus Thompson for another very successful event. On Apr 2, 2014, a luncheon talk was held at the offices of Kirkland & Ellis which was attended by an audience of 37 dedicated members. Richard Guo and Bao Chen, both Partners, and Ying Zhang, Counsel, of Fangda Partners discussed updates on regulatory landscape of the private equity and venture capital in China including new private fund regulatory regime, QDLP and free trade zone. The annual HKVCA Golf Day was a tremendous success with 63 eager golfers, a record number, teeing off in 16 flights under brilliant blue skies and warm sunshine. A windy day provided some challenges to the big hitters and, after completing their rounds, the tired golfers enjoyed a restorative lunch and the opportunity to share war stories. We would like to express our thanks to our generous sponsors, namely Platinum Sponsor Citi, Gold Sponsors Ernst & Young, UBS, and Lexington Partners, Breakfast Sponsor Davis Polk, and Aon, our Lunch Sponsor. We would also like to thank the Golf Committee, Impact Golf Management and everyone who participated for contributing to the success of this most popular annual event. The HKVCA’s 2014 Gala Dinner was held after the successful conclusion of the Asia Private Equity Forum (APEF) on Wednesday 15 January. A sell-out event saw close to 170 people sit down together to enjoy an evening of good food and friendship forged around the theme of the Chinese New Year, the Year of the Horse. The 2014 Asia Private Equity Forum (APEF) was successfully held on Wednesday 15 January at the Hong Kong Convention & Exhibition Centre. More than 400 attendees heard 52 speakers address a variety of topics on private equity markets across Asia.